The Rotary Club of South East Nassau learned about Expo 2020 Dubai from a presentation by H.E. Tony Joudi, Ambassador for the UAE and State of Qatar (middle). 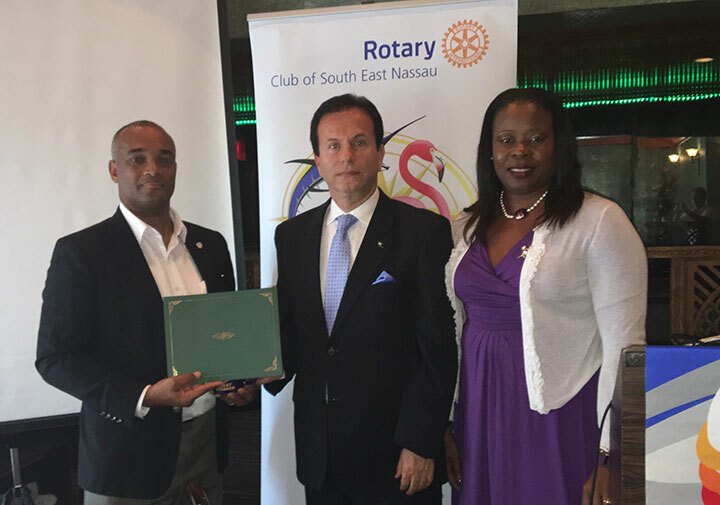 He was presented with a certificate of thanks from Tim Ingraham, Assistant District Governor, zone 7020 and a Past President (PP) of the Rotary Club of South East Nassau (left). Also present was PP Dr Bridgette Rolle who conducted the Rotary meeting. iPhone photo by Azaleta Ishmael-Newry. Nassau, Bahamas – New possibilities and exposure for The Bahamas will be realized with the country’s participation in Expo 2020 Dubai. Last Fall, it was announced that The Bahamas would take part in this world fair where 180 countries are expected to showcase achievements of their nations. Rotarians from the Rotary Club of South East Nassau heard about the six-month Expo that ends in April 2021 where approximately 25 million visitors are expected to attend. The Bahamas is looking for talent and participation for their pavilion and Rotarians were invited to play a part. With a collaborative effort between the Bahamas Ministry of Foreign Affairs and the University of The Bahamas (UB), a design challenge for the Bahamas pavilion for Dubai was kicked off by presentations from 4 groups. They comprised of students from the departments of architecture, culinary, as well as arts; their impressive concepts for the pavilions were well received. Another presentation will take place at the Harry Moore Library at the University on February 6, 2017. In April, the winning team will find out which design will be chosen to be built by the host country. Joudi further explained that the design competition aimed to help provide the Commonwealth of The Bahamas with the tools to generate exhibition proposals; they will serve as the foundation for the pavilion design. Additionally, it will offer Bahamian youth, the opportunity to demonstrate their talent and actively contribute to shaping the best possible representation of The Bahamas, while gaining national and international exposure. Since the first World Fair in 1851, there have been approximately 67 expos: this year’s event will take place in Astana with a theme of, “Energy of the future;” in 2019, it will be Beijing with a theme of “Live green, live better;” and in 2020, Dubai with a theme of “Connecting minds, creating the future.” For more information, log onto www.expo2020dubai.ae.